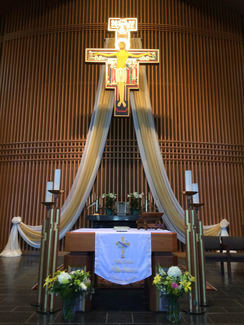 Holy Week and Easter Sunday are just around the corner, and we are in need of Ushers for many of the Triduum services and all of the Easter Masses. As you know, this is a very important time to have our Ushers and Greeters welcoming people at the doors of Church, especially those who have been away and those who only come once or twice a year. Each Sunday, and now, during our Easter Season, you have the privilege of "being the face of Christ to others" as they come to celebrate with us. If you will be in town and available to help out at one, or several, of these services, please sign up for any of the open Usher positions, below. Thank you for your service at this special time of the Liturgical Year ... and all year long. You are a blessing to our entire St. Francis Parish community.